Air India SATS Airport Services Pvt. 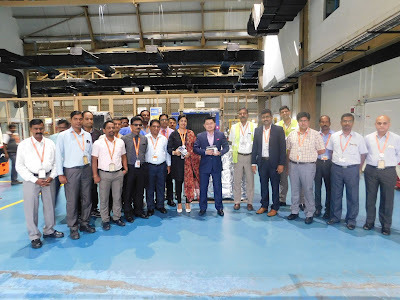 Ltd. (AISATS), India’s premier airport services company, has launched a new shipment tracking platform that uses Radio Frequency Identification (RFID) technology for its cargo handling operations at the Kempegowda International Airport, Bengaluru. AISATS will now be the first and only air cargo terminal operator in India to bring this RFID technology to the country for real-time and improved cargo tracking. This technological initiative is a collaboration between AISATS and its Singapore-listed joint venture stakeholder, SATS Ltd., which operates an unrivalled network of Gateway Services and Food Solutions in over 60 cities across Asia. AISATS’ air cargo operations at Kempegowda International Airport have increased substantially, with a new peak of 97,486 tones being reached in the 1st quarter of the current financial year. This is a growth of 16.6% over the same period in the previous financial year. As more airlines commence operations and increase their flight frequencies at Bengaluru, air cargo volumes and movement at Kempegowda International Airport are expected to surge significantly in the near future. With AISATS being the biggest ground handler at Kempegowda International Airport and managing two dedicated cargo handling centers, namely the AISATS Air Freight Terminal and the AISATS COOLPORT, the introduction of RFID technology will enable AISATS to undertake real-time cargo tracking for end-to-end visibility and faster turnaround. The RFID tracking system, capable of processing large quantities of cargo, will further bolster speed and accuracy, thereby making the cargo handling process more secure. The RFID technology uses radio waves to transfer data from an electronic reader to an RFID tag and vice-versa. The ground handling staff can use a hand held RFID scanner to scan the shipment pieces at various stages of the cargo handling process. Once the RFID-tagged shipment is scanned, the RFID-enabled device will send Airway Bill (AWB)-related information to a tracking platform, enabling all stakeholders to undertake real-time, end-to-end cargo tracking. The platform is capable of tracking shipments at two levels- the shipment piece level and the ULD/container level. Furthermore, this technology can be leveraged for a gamut of cargo services such as express cargo, valuables and perishables amongst others. “With cargo volumes burgeoning in Bengaluru, it is imperative that we embrace innovation and technological advancements to create an efficient cargo handling environment. The RFID technology has a unique advantage of tracking shipments at piece level, which brings transparency to the supply chain and helps AISATS manage large volumes of cargo seamlessly. We are excited to be the first air cargo terminal operator company to implement this technology in India at Kempegowda International Airport. The new system will help reduce cargo turnaround time and improve handling efficiency, thus promising a hassle-free experience for all stakeholders. AISATS will continue to collaborate with SATS to harness its technological and operational expertise in developing new capabilities that will add value to cargo and ground handling operations at the airports we operate in India.” said Mike Chew, CEO, AISATS. Apart from this latest RFID tracking system, AISATS has previously introduced many other firsts to the cargo handling system at Kempegowda International Airport such as the Automated Storage & Retrieval System (ASRS), the Very Narrow Aisle (VNA) and High Rise Racking System at its Air Freighter Terminal. AISATS has also developed India’s 1st integrated on-airport perishable cargo handling center, the AISATS COOLPORT. AISATS is also the first air cargo operator in Bengaluru to launch its very own ‘AISATS Cargo App’, which furnishes its customers with comprehensive cargo tracking solutions. In addition, AISATS has also became the first Indian air cargo terminal operator to achieve TAPA ( Transport Asset Protection Association) FSR 2017 Class A certification which ensures highest security standards at the cargo facility.